We were invited to a special parents and carers view of Ancient lives, new discoveries at the British Museum this week. This new initiative sets aside a two hour slot during which parents and carers can bring children of any age to the Museum’s current exhibition without worrying about disturbing people – plus there’s a free tea or coffee for the adults in the café afterwards. So, how was it for us? Ancient lives, new discoveries tells the story of eight mummies from Egypt and Sudan, using digital technology and imaging techniques such as CT scanning to “unwrap” the mummies and reveal their secrets. 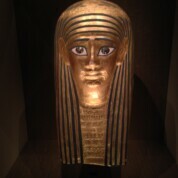 From a corpse mummified naturally in the desert sand, to the ornately decorated gold casket of a high-ranking priest’s daughter – each mummy has a unique story. I was curious to see how MJ would get his three-year-old brain around what is essentially a bit of a gory topic, but he seemed to emerge unscathed from the experience with a new found interest in Ancient Egypt. He was fascinated by the interactive exhibits allowing you to turn a wheel and slowly reveal the contents of the mummies’ caskets; the amulets hidden in their bandages to protect them in the afterlife; and the toy horse and mouse belonging to an Egyptian child. There were quite a lot of other families with small children and the atmosphere was relaxed. There was a buggy park available (we didn’t use it and took the buggy inside) and members of staff were meeting and greeting families and handing out family trails (a simplified explanation of the exhibition and activities for children) and coffee vouchers. I’ve never found the British Museum to be as easy to navigate as some others, due in part to its size, the sheer number of visitors, the long queues for baby changing/accessible toilets at busy times and the fact that there are lots of stairs everywhere. The powers that be are obviously aware of this, as members of staff had been posted by the stairs to the café (upstairs) and toilets (downstairs) at the exit to the exhibition to help carry buggies, and a changing mat had been provided in the ladies’ loos (there was no dedicated baby changing in that part of the museum). All of this was brilliant to see – and is a great reason to go to a dedicated parent/carers view – but I wouldn’t have attempted it on my own on a normal day and would have gone to use the more accessible facilities in the Museum’s Great Court. Our overall impression? The session was well-organised, welcoming and relaxed; the exhibition is well worth a visit; and I defy you to get through the gift shop with small children without acquiring some mummy-related books or souvenirs to take home.